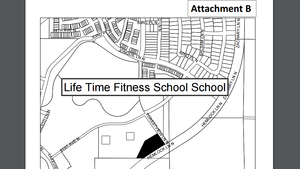 The Maple Grove City Council approved a resolution for a Planned Unit Development Concept Stage Plan Amendment for Life Time Fitness Swim School at the June 19 meeting. The standalone swim school is proposed at the northwest corner of the intersection of Hemlock Lane and Forestview Lane North. According to documents provided to the council, the proposed 17,750 square feet facility would include two swimming pools (with swimming lessons for all levels), a locker room, and a coffee bar. "Life Time has enjoyed a strong relationship with the City of Maple Grove in their shared facility south of Weaver Lake Road. Demand for these popular aquatic related services and programs are often greater than Life Time can provide in the shared facility," Life Time Fitness stated in their proposal. "To meet the demand, Life Time is proposing to build a standalone swim school in the northwest corner of the intersection of Hemlock Lane and Forestview Lane North." Between 30-50 employees are anticipated for the proposed new site - 16 employees typically onsite at one time.